State canvassers on Thursday approved a ballot proposal to decriminalize recreational use of marijuana in Michigan. The proposal, backed by a committee called the Coalition to Regulate Marijuana Like Alcohol, likely is headed for the November ballot. But the state’s four-member Board of State Canvassers deadlocked 2-2, along party lines, on whether to certify a petition to repeal Michigan’s prevailing wage law, which essentially establishes union-level wages on state construction projects. Democratic members Julie Matuzak and Jeannette Bradshaw opposed certification, citing an unresolved challenge from union-backed opponents of the measure. Backers of the prevailing wage vowed to take the matter to court. The pot measure enjoyed more success Thursday, passing unanimously. Nine states and the District of Columbia currently allow recreational sale of marijuana. The proposal will first go to lawmakers, but the Republican-dominated state House and Senate must approve it for it to become law. An unlikely prospect. The House doesn’t intend to take it up, said Gideon D’Assandro, spokesman for House Speaker Tom Leonard, because there isn’t enough support among Republicans and Leonard (who is seeking the Republican nomination for Attorney General) himself doesn’t support it. Scott Greenlee, president of opposition group Healthy and Productive Michigan, argued that canvassers should reject the proposal on the grounds that it violates federal law, under which marijuana remains classified as an illegal drug. Canvassers, though, noted that making that kind of determination was outside the scope of their powers. No one challenged the validity of the group’s 365,000 signatures within a deadline set by the state. On the effort to repeal the prevailing wage law, the question left open Wednesday — that judges likely will decide — is whether petition circulators hired by Protecting Michigan Taxpayers, a pro-repeal ballot committee, gave the state addresses to businesses, hotels, uninhabited homes and post office boxes instead of their own home addresses, as required by state law. The challenge was raised by attorneys for union contractors who oppose repeal. 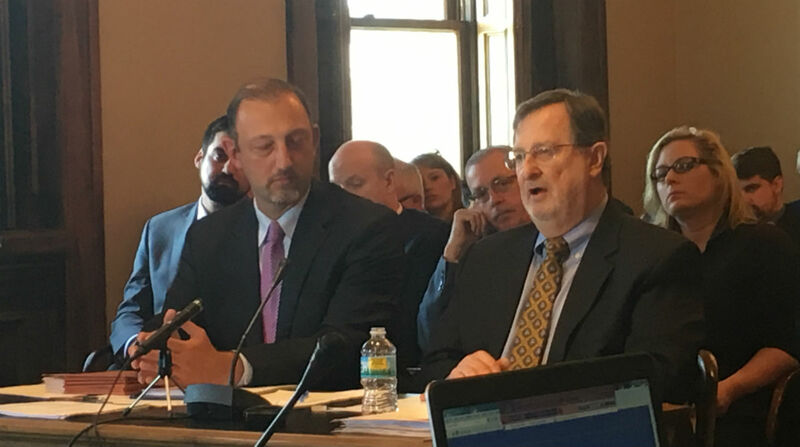 Jeff Wiggins, Protecting Michigan Taxpayers’ president, had hoped the effort to repeal Michigan’s prevailing wage law would be on its way to lawmakers for approval after Thursday. Instead, he said he is planning to take his fight to court. “As soon as we possibly can,” Wiggins told reporters. State elections law requires petition circulators to list their residential addresses, not post office boxes or other locations. Andrea Hansen, a Lansing-based attorney representing trades unions, argued Thursday that circulators who failed to do so should be held accountable for breaking state law by having signatures they collected disqualified. Attorneys for Protecting Michigan Taxpayers countered that even if the board threw out signatures from the circulators in question, they believed the committee still would have enough valid ones to qualify for approval. The state’s Bureau of Elections had decided the pro-repeal group turned in enough valid signatures from registered Michigan voters after two samples were reviewed and recommended the board’s approval Thursday. The board’s deadlocked vote prevented the measure from advancing. Wiggins, who is also state director of Associated Builders and Contractors of Michigan, a Lansing-based trade group that includes mostly non-union contractors, said he intends to ask the Michigan Court of Appeals for resolution and to allow the repeal proposal to move forward. The prevailing wage law, on the books for more than 50 years, requires contractors to pay the wage prevailing in a particular community — typically, union-scale wages and benefits — on state-funded construction projects. Opponents of prevailing wage, generally non-union contractors, say the law artificially inflates the cost of taxpayer-funded projects. Associated Builders and Contractors has support from Republicans in the Legislature, who see repeal as a legislative priority but have been stalled by Gov. Rick Snyder, who likely would veto any bill. Union-backed contractors tend to support the law and say repealing it would lower wages and weaken the attractiveness of worker training programs as Snyder seeks to increase enrollment in skilled trades. Under Michigan law, the Legislature gets the first shot at approving citizen-driven legislation, which is why the pro-repeal group was eager to get the measure before the GOP-majority House and Senate. Lawmakers can enact such proposals on their own and, crucially, they’re immune from a governor’s veto. Wiggins has said his goal is to have the Legislature enact the repeal proposal, bypassing Snyder and voters. Senate Majority Leader Arlan Meekhof, R-West Olive, has been one of the proposal’s chief supporters. He is “disappointed that two individuals chose to disregard their duty in favor of taking a purely political position when considering the Protecting Michigan Taxpayers petition,” spokeswoman Amber McCann told Bridge. Canvassers’ decision Thursday means another ballot proposal will begin circulating in earnest this spring. Building trades unions have kept their own proposal to keep the prevailing wage law intact in their back pocket as the repeal proposal moved through the process. But Pat Devlin, secretary-treasurer of the Michigan Building and Construction Trades Council, told Bridge that signature gathering will accelerate now to try to meet a May 30 deadline to secure more than 250,000 signatures from registered Michigan voters. His committee, Protect Michigan Jobs, also will use paid circulators to collect signatures. It’s a common practice among ballot committees. But Devlin said his group will pay close attention to their circulator’s practices. I support legalizing marijuana, but I don’t support taxing it any higher than our 6% sales tax. So, I’ll vote no on this proposal. Tax on alcohol should be reduced to 6% at the state level as well, and should be eliminated at the federal level. Do our constitutions (state and federal) provide for singling out certain items for special taxation, or is this something lawmakers and the courts have gerrymandered out of constitutional language? A friend of mine just paid more to a drug dealer for pot , than what you would call "overtaxed weed" would cost when made legal. That money is not going to the state at all, and as a bonus my friend could go to jail and cost the state even more. Your way the dealer (or his boss) keeps all the profit. But ...whatever keeps the government boot off your throat I guess. This vote should be appealed. All for medicinal marijuana, not at all for recreational use. It is a drug, it impairs response time. So now, let us all worry about drunk drivers as well as high drivers. There will be lives lost. I love it when I hear that pot is just a plant. Very stupid way to begin an intelligent conversation, so is heroin; a poppy flower, so is cocaine; a cocoa plant. I find it odd our government wants a war on opioids, but marijuana is legalized. We should expect and will have many legal cases.